To The Green is our weekly look at one game current in Steam’s Greenlight process. There are many games mired here, and some of them have good ideas stuck in the gears that Valve has in place. Here we seek to bring to mind one game a week to discuss. The line dies and you look around the room at the soldiers with you on your capital ship. The war had been going on for a while, slowing losing ground with defeat seemingly inevitable. It seemed impossible, but it had finally happened. By now, everyone who had sent that message was dead in a desperate attempt to buy mankind some time. “Meya Colony, this is a red alert from Earth Defense. Prepare for evacuation and imminent attack from the enemy. We are on our way. Commodore Jamie out.” You send the message, knowing it won’t arrive too long before you do, and take your small group of ships into hyperspace tunnels racing towards Maya, an attempt to save one more portion of the human race. That is Human Extinction Simulator in tone – if not any words it actually says. Humanity stands at the brink of extinction and its out gunned, out massed and losing this fight. Nothing short of brilliance can and will save humanity from being wiped out of existence. Many ‘Simulator’ games have you take on the role of whatever it is – a goat, a farmer, or so forth. In this one, it’s simulating a scenario – the worst case situation. I don’t say this lightly, but this isn’t a game for the faint of heart, because it is designed to be extremely difficult as a combat focused game. If you aren’t ready to die and have to try to figure it out again and again to get what you did wrong right you may want to turn back now. Alright, so for those of you still here, Human Extinction Simulator features a lot of ships and it’s your attempt to protect the human race from a genocidal enemy. In many fights you’ll find yourself outgunned and have to make proper use of movement and positioning which are the key parts of this games tactics. 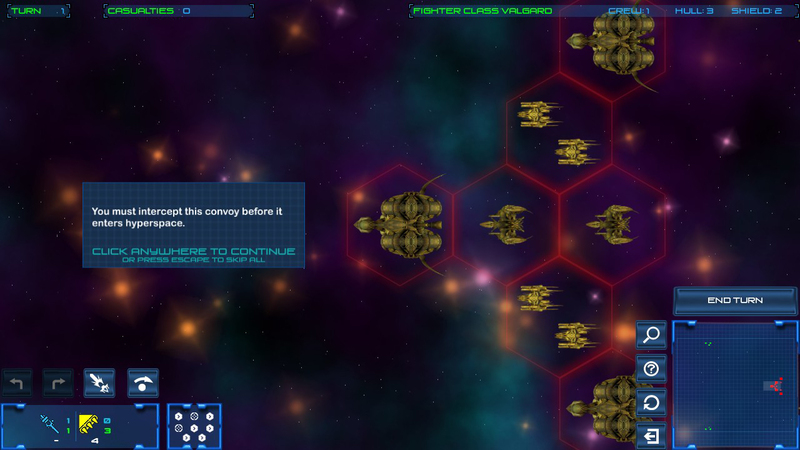 It takes part on a grid map and each ship has a direction it is face and how far it can move. As you see each space you can end in has an arrow – that is the facing direction and all your weapons have facing as well. In the case of the fighter here, it can only fire forward 3 swards and hit 2 beside squares 2 and 3. The fighter’s good mobility makes this easier but far from simple, and unlike some ships, the Fighters can only turn by moving. In each turn you can take 2-3 actions depending on the ship. For ones without weapons, like transports, you can double move and you want to be careful to stay out of enemy fire ranges. Knowing where your enemy can fire now or after a single move is another key part to watch, though the game tries to help with its spacebar functionality that shows that (Red Alert means you’re in target, Yellow means you can be after a move). 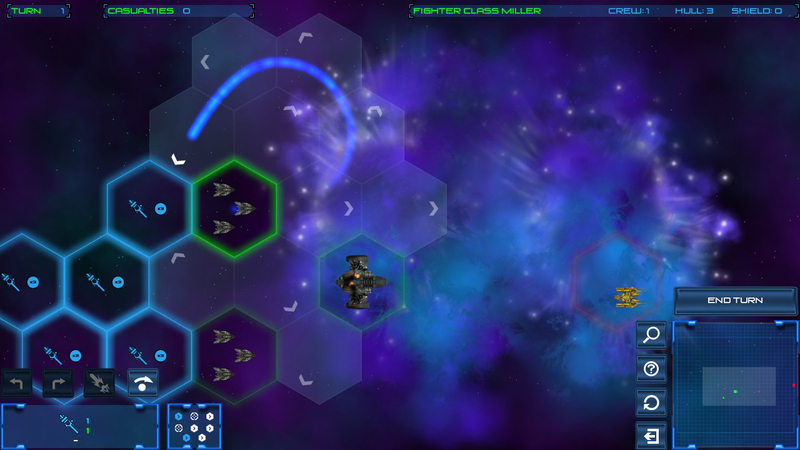 Ships with weapons can typically take 3 actions in a turn – they can fire, move and move, move, fire, move, but cannot move, move, fire – presumably for balance reasons. It does get frustrating sometimes trying to line up a shot with the directional facing issues, especially given that turning is a full round action. I think that making turning a single hex direction wise a move action would probably be fairer, but tough to say without attempting it. Remember, the opponents could do that too, which could make it more challenging. This is how the tutorial images look, also one type of mission you might have to do ! There are over 40 ships in Human Extinction Simulator, all with their own firing radius, weapons that can damage shields or hull differently, move speeds, turning abilities and I’m sure there’s more I haven’t seen in my limited time with the game. With those various ships, there will be over 30 missions to complete with different sorts of goals and parts – oftentimes not just something like ‘destroy all enemy’s’ but instead actual things you would be doing in this type of scenario – evacuate, delaying, harassing enemy supply’s, gathering intel, and of course sometimes a big fight as needed. One of the other interesting things about the title is that it is going to launch with mod readiness as an indie game for people to put in their own spaceships and scenarios. This can give a lot of life to a game like this which already has secondary objectives and combat that requires a lot of thinking to get right. Do you know a game you think To The Green should focus on next? Email [email protected] about it and we’ll take a look!